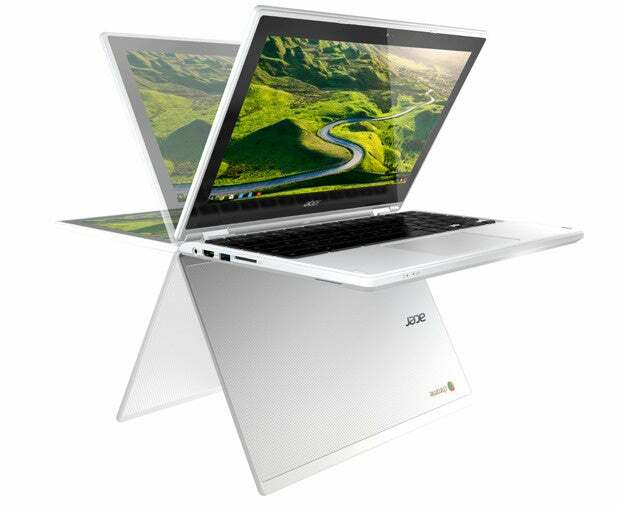 Acer's new Chromebook R11 isn't your average Chromebook -- and that's precisely why it might be worth your while. 2015 may almost be over, but one final Chromebook is sneaking its way onto store shelves before the year's out -- and despite its late arrival, this is one that shouldn't be ignored. 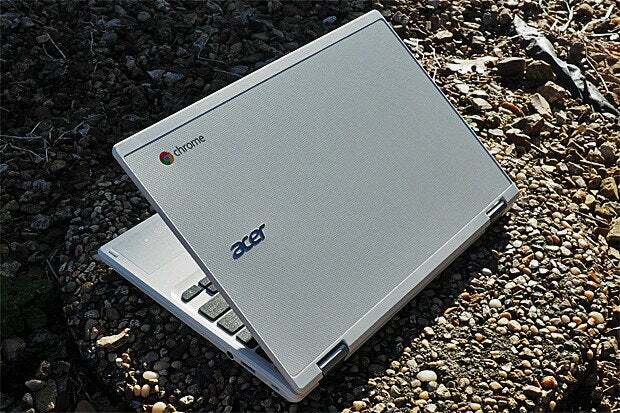 Meet Acer's Chromebook R11. The compact convertible was originally supposed to come out in November but is just now starting to make its way into the world. It's available for $280 with 2GB of RAM or $330 with 4GB of RAM (the latter being the option most people will want to get, given the choice). The 4GB model is also on sale through December 26th from Costco for $260 -- with a free wireless mouse and $20 Google Play credit, to boot -- which is a hell of a deal. So what makes the Chromebook R11 matter? Simple: It's a small-sized Chromebook with a higher-quality IPS screen (translation: the kind of display technology you want). That'd be enough to make it worth considering, but there's another bonus: The Chromebook R11's screen is touch-enabled and capable of flipping back all the way around into a stand, tent, or tablet-like arrangement. We've seen that sort of form before, most recently in Asus's Chromebook Flip -- but where that device was too small to be ideal for actual productivity, this one is less netbook-like and more versatile. Its display is 11.6 in. (compared to the Flip's 10.1-in. size), which puts it in line with most of the standard compact Chromebooks we've seen in the past. Aside from giving you a more reasonable amount of screen space for work, the R11's footprint means you get a normal full-sized Chrome OS keyboard (unlike the Flip's, which is cramped and awkward to use). The keyboard is easy to type on and very much in line with what you'd expect from a Chromebook in this class. The same can be said for the trackpad, which is fine if unexceptional. It works well and is accurate. The R11's stamina has been respectable, too: In my first day with the laptop, I've managed to make it through about eight hours of steady use -- with heavy multitasking and occasional video-streaming -- before running into the red zone of low battery. Acer quotes the system as having "up to 10 hours" of battery life, and with more moderate (aka "normal") use, I wouldn't be surprised if you managed to hit that upper limit. The Chromebook R11's display is good, meanwhile -- not great, but good. The use of an IPS panel is the main thing that helps it look better than the displays on many baseline Chromebook systems, as IPS technology results in a more vibrant image without the graininess seen in lower-end TN panels. It also has noticeably better viewing angles than a TN-based display can provide. That being said, the R11 sticks to the bare-minimum 1366 x 768 resolution that's common in lower-level Chrome OS systems. It's okay enough for casual use, but you can definitely see a major difference between that and the 1080p resolution on higher-level systems like Dell's Chromebook 13 and Toshiba's 2015 Chromebook 2. I can clearly make out pixelation in the letters as I type this story into Google Docs on the computer, for instance. It's not horrendous, but things certainly aren't as crisp as they could be. As for the screen's swiveling and touch-enabled nature, that really is a nice bonus. For reasons I've discussed in detail before, I wouldn't consider it a critical element -- and using Chrome OS in a touch-oriented manner never makes for the most natural or complete-feeling experience -- but it's a neat extra option to have, and it can certainly be useful. I like being able to reach up and tap something or pinch to zoom into a page on occasion, for instance, and the ability to flip the screen around and put it into a stand mode (with the keyboard upside-down and extending out backwards as a base) is handy for things like scrolling through social media on the couch or kicking back and watching videos. Just remember that the resolution here results in a significant step down from the level of image quality we've grown used to seeing on touch-native devices like smartphones and tablets -- a factor that somehow seems more apparent when you're using the device in a touch-centric manner. Last but not least, the R11's build quality is decent for its domain. 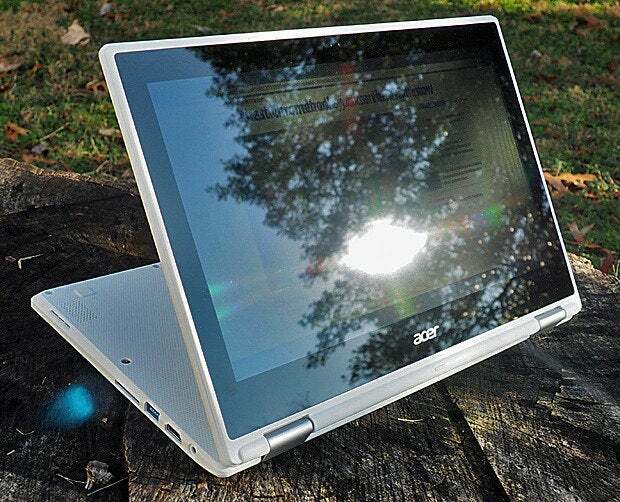 Acer has stepped things up a bit with the addition of an aluminum panel on the laptop's lid. That being said, the body is largely plastic, with a fair amount of give when you press on most surfaces (even the lid, which flexes easily with just a small amount of pressure) -- and the hinges connecting the two halves are small and plastic, with a long visible gap between them. All in all, I'd describe it as being on the upper end of entry level. And you know what? For this price point, that's pretty darn impressive. Acer's Chromebook R11 has a lot of good things going for it, whether you look at it as a convertible laptop or even just a compact Chromebook. And that's what it boils down to: If you want a smaller system and/or one with the versatility of a convertible, the Chromebook R11 is well worth considering -- especially with the current Costco deal, but even at its regular $330 price. If those factors aren't important to you, you might do better with Toshiba's 2015 Chromebook 2, which costs the same $330 and has a larger and higher resolution (13.3 in., 1080p) display, or with Dell's Chromebook 13, which costs a hundred bucks more but brings you firmly into midrange terrain with elevated build quality, exceptional stamina, and a spectacular glass trackpad (along with the same higher-caliber 13.3-in. 1080p display as the Toshiba device).